NEW: Geithner calls agreement "most important strategic achievements"
NEW: Chinese Vice Premier Wang Qishan calls talks a "full success"
WASHINGTON (CNN) -- Two days of high-level talks between the United States and China concluded with broad agreement on separate strategies to help their economies and the world emerge from the global recession. 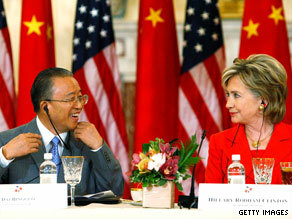 Chinese state councilor Dai Bingguo confers with Hillary Clinton on Tuesday at the U.S. State Department. Treasury Secretary Timothy Geithner said on Tuesday the United States will emphasize fiscal discipline on both the federal and personal levels, while China will encourage more domestic spending instead of relying on foreign demand. "The basic importance of this is the recognition by both of us that things are going to have to change going forward," Geithner told a closing news conference for the "Strategic and Economic Dialogue." He called the agreement on complementary economic strategies the "most important strategic achievements" of the talks. Secretary of State Hillary Clinton called the two-days "unprecedented" in U.S.-China relations, noting they were the largest gathering of top leaders from the two countries and covered a wide range of issues. "The result is that we have laid the foundation for a positive, cooperative and comprehensive relationship for the 21st century," Clinton said. Chinese Vice Premier Wang Qishan called the talks a "full success, " emphasizing the joint strategy to stimulate economic growth at home as a top priority while the world moves toward recovery. The dialogue set up by U.S. President Barack Obama and his Chinese counterpart, Hu Jintao, was intended to address a series of issues, including the two countries' response to the global financial crisis, climate change, nuclear proliferation and the ongoing conflict with religious and other extremists. "We want to be very careful, as we work together to help move the ... global economy back from crisis to growth, that we don't lay the seeds of future crises," Geithner said at the closing news conference. "So ... as we move to raise private savings; as we move to bring down our fiscal deficit in the future; as we move to put in place a more stable, more resilient financial system in the United States, we need to see actions in China and in other countries to shift the source of growth more to domestic demand." The talks also produced agreement on joint cooperation toward combating climate change by shifting to low-carbon economies and reducing dependency on foreign oil. Obama has made reducing greenhouse gas emissions a priority of his administration, but the Chinese government has been reluctant to sign on to international agreements that, according to some analysts, could slow its rapid economic growth. Clinton praised the Chinese for what she called important steps toward clean energy being taken in the run-up to U.N.-led negotiations on a new global climate change treaty scheduled for December in Copenhagen, Denmark. Economists said China is worried about the soaring U.S. fiscal deficit and any attempt by the United States to "inflate" its way out of the crisis. Such a move would hurt the value of Chinese investments in U.S. Treasury bonds. At this meeting, U.S. officials said they, in turn, are warning China that the U.S. economy has fundamentally changed in response to the crisis. Americans are saving more and buying less.